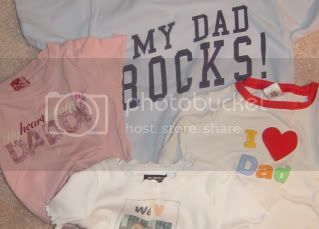 Father’s Day Idea: Make Dad Feel Like a ROCK STAR! There was a time when we freely expressed our passions by emblazoning them on our chests. The Party MOMster had a GO GOs baseball t-shirt with 3/4 length purple sleeves that was worn with pride. (sigh) Good times…(written wistfully) Even the staffers proudly wear their faves: Nemo, Disney Princesses, Dora. Doesn’t Dad deserve this kind of adoration? This year, we will continue this tradition with handmade shirts using supplies (fabric markers and iron-on inkjet sheets) from our Guest of Honor Project . But, I wanted to put this out there in plenty of time for others to partake. We will be working on ours today as we enter our 11th day of rain and 14th day of summer vacation. So, have fun and show your love, because DADs ROCK!!!!! Well, the Party MOMster and staff are on high alert in preparation for Father’s Day. I purchased cards today and OUCH! that really adds up. We will likely be making more of our own cards in the future. Especially after the staff added their personal touch to today’s posh purchases — they are barely recognizable. 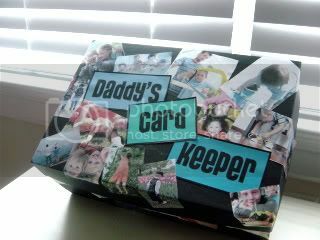 But, enough regrets — the staff and I created a nifty card keeper to keep those little slips of gold in as a Father’s Day Gift a few years back. We used a photo box bought at the craft store and covered it with pictures of Mr. Party MOMster and the staff. Mr. Party MOMster is very sentimental and couldn’t image tossing out his beloved cards, so now he has a safe place to keep them. Now, if your staff is a bit young or heavy with the glue stick, you can also use Full Sheet Ink jet Printer Labels at an office supple store. You can just print out your pictures, cut them out and stick them right on. It looks nice and neat and the pictures are less likely to curl or pop off. I love these label sheets. We have used them on goody bags, presents and invitations. For those of us that are a little less sentimental and want to get a bit more mileage out of our pricey bits of paper, I have started keeping a small scrap box of old cards. The staff can take bits to make other things — like cards (I should have remembered that earlier), place mats, bookmarks, art, etc. Have any handy Father’s Day gift ideas? Please share. We love to spoil our Dad, Grandad, Poppy and Great Grandad on Father’s Day.